All family members rush to home. Amba gets worried. She prays for Ranveer. In car, Ranveer’s dad asks Harshad if all okay. Harshad says someone has accused Disha. Ranveer’s dad tells him she’s his daughter and she must have not done anything wrong. It would be the accuser who will get embarrassed. Harshad thinks in either case, he’ll be hurt. Harshad reaches home and asks Disha to say him the truth. Disha feels scared, but Baa gestures her to be strong and say it. Harshad gets shocked and disbelieved after hearing the truth from Disha. All wait for Ranveer. Ranveer comes with his family. 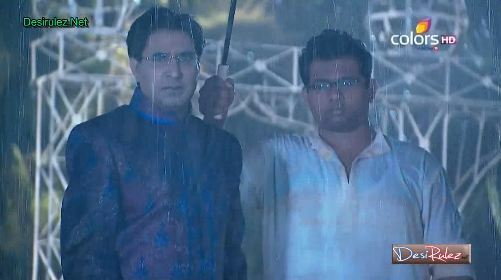 Amba tries to stop him, but he still goes to Harshad. Disha starts accusing Ranveer. Ranveer says she’s lying. He falls in Harshad’s feet and pleads to believe him. Whatever he is today is because of him and he had never seen Disha in such way. Other family members arrive and are shocked to see all this. Ishaani supports Ranveer. Falguni fumes seeing Ishaani and Harshad not believing Disha. Disha tells Ishaani that Ranveer raped her because of her, he loves her and when he saw her going away, he took out his frustration at her. Falguni shows Ishaani’s photos and belongings that she got from Ranveer’s room. Harshad just stands still in shock. Ishaani still takes Ranveer’s side and says all best friends keep their friends memories with them, even she has many of Ranveer’s belogings which doesn’t mean she loves him. Garima enters and says she will tell the truth to everyone. Ranveer gets happy, but Garima also speaks against Ranveer. She says Chirag is not father of her child. Ishaani doesn’t believe her. She asks Ishaani why she would let Chirag marry her then? She further shows recording to everyone in which Ranveer requested her to stop Chirag-Ishaani’s engagement and also that he loves Ishaani from childhood and he can’t see Ishaani going to Chirag. All brothers start beating Ranveer, but Ishaani again defends Ranveer. She takes him to the lord and puts his hand on her head. She asks him to say the truth to everyone. Ranveer says he didn’t do anything with Disha. Ishaani gets happy. She then asks to tell everyone they are just best friends, he doesn’t love her. But Ranveer cannot do that. He moves his hand and tells her he can’t lie to her. He confesses his love and everyone is shocked. Precap: Ranveer is being beaten up in jail. His parents plead police to stop. Other side, Ishaani cries and apologizes to Chirag. She asks him for another chance, but he says it’s too late. ranvir tells her that he does love her, and that he never saw her with wrong eyes, and never meant wrong for her. He tells her his entire love story that was one sided. All are shocked beyond belief. He tells that only she made him alive, instead of being treated like a servant by everyone else. He says that he never tried to get her, and he was content with it, as he knew that she was unattainable, and that he never tried to see her with him, but didnt want her to be with someone else, who is wrong, hence got chirag’s marriage called off with her, as he wanted a nice guy for her, for the simple fact that he loves her purely. Harshad reprimands ranvir for daring to love his daughter and claims him to be disloyal, and starts slapping him. baa and disha are amused, while others are furious and tensed. amba’s parents are distraught. Harshad asks him to be taken away. The brothers get to beating him ruthlessly, while amba and her husband try to save him. He continues to rant about the sanctity of his love. falguni asks him to never speak of ishaani’s name again. She sends her men too to beat him. ishaani is shell shocked and collapses on the floor. Her bhabhi comes to compose her, and take her upstairs. falguni is tensed and furious. In her room, ishaani remembers ranvir’s confession and the beating he got, and then tries to link all the past pieces together. she also starts remembering chirag’s initiative, and she is in a dilemma as to who to believe and what to think. falguni finds her breaking down into tears, distraught and apalled, of having lost chirag, due to all this, for a huge misunderstanding. 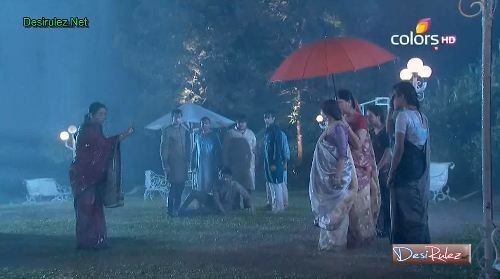 While harshad, disha and falguni watch, ranvir is beaten mercilessly, in the garden under heavy rains. baa throws amba too on the lawns. ranvir gets into a rage. Amba winces in pain, while baa mercilessly kicks here in the stomach. Her husband pleads and begs baa to stop this. baa says that they deserve this, for having given birth to a child like him. she smears amba’s face with dirt, staining it, for having produced a son like that. baa says that now its all balanced. Baa begins to go, when amba gets up, saying that balance shall happen, and if god bears a relation with anyone on this earth, then they shall live to witness this balance. she taunts them for not even understanding love, and tainting ranvir’s love, which is pure as the truth. Amba says to baa that she isnt angry that ranvir loves ishaani, but angry that ishaani didnt get married in the wrong house, which ranvir stopped. Baa is tensed. she tells falguni that she didnt marry harshad for love, but for his money and fame, so that her daughter could get all that. ranvir listens silently. Amba finally turns to harshad, that ranvir doesnt tire talking about him, but he too became disloyal. She reminds how harshad stopped them from going, and for what, slapping him and believeing the false lies, and asks him what kind of love is this, which changed overnight. She says that ranvir sacrificed everything for him, and made him reach business heights, was meted with such treatments. He is tensed. Amba rebukes them for calling themselves big people, when they have such small shrunken thinking. She tells them that they respect Goddess laxmi, but beat the person due to whom Laxmi comes. she points out the hypocrisy and irony that they show in their deeds and their principles. baa asks her to get lost, and if she wants her stuff thrown out. Amba asks her to do so, give back the years that her husband and her son have given for them, so that ishaani and harshad is always happy. she asks baa if she can truly give that. Amba asks baa not to think, that servants are leaving, but the protection is goiong, the one who saved this house from every trouble, and maybe the world didnt see this, but god did, who made the world, and Ganesh who came on ranvir’s shoulders, shall do balance, and the hosue in which lies prevail, nothing good can come in that house. Amba tells that they may have tainted them today, only because they are poor, and one day this poverty shall smile on them. Amba says that they showed naked richness and Ganesh shall shopw them true poverty, and that they shall lose all and the people who tainted poors, shall be poor themselves, and thats the curse of a mother’s wrath. Amba tells them to wait and watch them take their doom over. Just then, police arrives, and all are surprised. The police takes ranvir and his family, while he tries to struggle. ranvir is shocked to see his parents too in chain. He pleads for them to be left, but the inspector slaps him. baa asks them to be taken away, and beat them and their ego. the policre hollers at them to be taken away, and they leave resignedly. Baa stands satisfied. harshad watches tensed. The police leaves with them. Chirag stands satisfied, while his mother asks him to call ishaani, as she would agree to everything. chirag takes the phone and throws it, saying that it got broken just like ishaani’s heart. His mother tries to convince him that this is the right time to call ishaani, when she is being linked to their servant, and harshad would treat him like a god. He says thsat ishaani would herself come to him. From the window, both the mother and son duo, find that ishaani is rushing through the heavy rains, towards chirag’s door, and that many people tried their level best to get him out of the way, but got out themselves. Ishaani cries distraught, while on the other side, chirag and his parents stand satisfied. Finally chirag amused at her plight opens the door. Ishaani apologises profusely to chirag for the huge misunderstanding that she had, and asks desperately fort another chance, amidst unstoppable tears. He says that its too late now, and he doesnt want to keep any relation now. she is shocked. She apologises saying that this wont happen now ever again. Chirag says that had she loved him, she wouldnt have believed their servant over him. Chirag says that it happened multiple times, and that he cant bear his and his family’s insults amnymore. She gets on his feet saying that she wants another chance and literally begs for one. chirag gives a thumbs up to his parents watching in the gallery. He plays innocent one, saying that he cant see her crying, and if this ever repeats itself, he wont be able to survive. She stops him from speaking more, saying that it wont happen again at all. She opens her hand to reveal their engagement ring and asks him to make her wear iut once again, and says that this time she would bne utterly loyal to him. He finally gives in, and she hugs him. He hugs her back, while eyeing evilly his parents. He asks her never to misunderstand him again or else he would go very far away from him. She says that wont happen. They both hug. 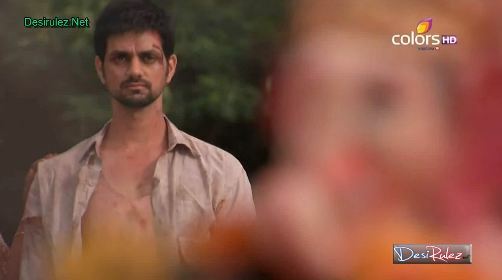 While amba and her husband are locked up in separate cells, ranvir is beaten mercilessly in the police station, while amba and his father are distraught. 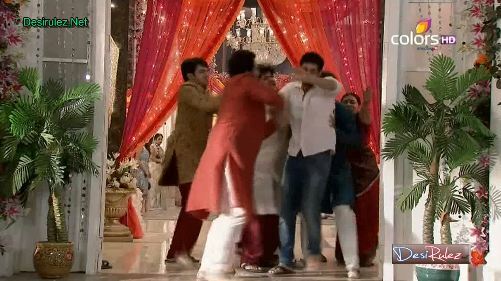 Then they start beating up his father too, while amba and ranvir are distraught. Amba breaks down crying apalled. ranvir’s parents are distraught to find that even after being beaten so badly, he still continues to incoherently rant ishaani’s name in his semiconscious state. The next morning, they try to wake up ranvir, and he is barely able to open his eyes and walk, and amba and her husband come and take him, as the inspector informs them that they have been given bail by some person. they leave. As the entire city get ready for the Ganesh immersion procession, amba arrives with her family there. Ranvir starts lamenting as to what did Ganesh do this time, as he ruined everything. amba asks him not to shed any more tears, as those who didnt care, shall now have to shed tears of blood. She tells him that he would return back here, as a mother’s heart says, and the soil that he used to worship, today has been tainted with allegations on him. She asks him never to forget this humiliation and recognition of this kind for his loyalty. she asks him not to think that the lord thinks him wrong, but to think that the lord is waiting, to unleash his wrath as the third eye opens, and with that, also the doors to that place which threw him out. Amba tells him that this time, ganesh didnt leave the house on his shoulders, but very soon he would come back on his shoulders. They eye the immersed idol with determination. AFTER TWO YEARS: Baa and chanchal again come in for Ganesh Stuti, visibly poorer and less in stature, as all gather again for the ganesh chaturthi. Baa thinks that for the past two years such has been the condition, that they have had to visit Lord Ganesh at otherss’ houses. Others start taunting baa about her past and her character. They formally introduce themselves to baa asking if everything is alright. They ask her if she would come for immersion processions today. Baa says that she wouldnt even be able to come as her daughter’s marriage has been fixed. She invites them all, and they comply. But not before overhearing, that now her tone has become subtle, after having lost the money and fame. Baa overhears them and is disturbed. She overhears others talking whether ishaani is getting married. baa clarifies that disha is getting married, and ishaani is still in the waiting list. Baa starts moving out, and is furious but stays silent. ishaani waits anxiously outside her boss’ cabin, while the peon comes and asks her to sit down. ishaani is restless though. Ishaani calls chirag and a lady picks up saying that he is busy in the meeting. She asks her to give a message to Chirag that disha’s marriage is being finalised today and his presence is important today and that she shall come to pick him up. When the boss comes out, he refuses to talk to her, and asks for the driver to get the car out. the peon tells him that ishaani is waiting for 4 hours, and then she asks him to hear her out for just two minutes. ishaani hesitatingly demands for an advance of half of her salary. the boss gets angry and reprimands her for her demands, reminding her that he isnt running a charity. She says that what happened two years back, they are still recovering from the shock, and soon shall come back. He identifies her as harshad’s daughter and taunts that he lost all shares to his father’s debacle and he wont do the same mistake again by trusting harshad’s daughter. he refuses her request and leaves. ishaani is disturbed. ishaani gets a call, from falguni, reminding her to pick up chirag and then come, and about the advance, and about how she has chosen a dress for her too, from disha’s old dresses, and asks her to be ready too, for her sister’s big day. Ishaani is disturbed and tries to tell her about the boss’ refusal for advance but falguni doesnt give her a chance ranting herself about all of it. She finally cancels the call. In their room, while falguni starts looking around for disha, Baa starts furiously commenting on how she would set the ladies straight, once she gets her stature and fame back. Falguni taunts that even in poverty she hasnt lost her ego. falguni asks her to be silent as even after much difficulty they have managed to grab a suitable groom for disha. Baa tells her that disha herself is nice, and hence she got such a nice groom. she asks falguni to smile a little, and not frown all the time. Falguni asks for some money from baa, reminding her that ishaani hands over her entire amount to her. But baa wards it off, saying that its very mneagre and no savings are possible, and that the house is actually running on her selling her old jewellery. falguni says that they shall have to give some sort of shagun for the marriage to be finalised. baa tells her that for disha, she has saved a last jewellery item. Falguni asks what about ishaani, as she too is her granddaughter and her son’s daughter, as they both eye harshad’s pic on the wall, emotionally remembering that things turned into a debacle, after his death, or he definitely would have taken care of things today. falguni reminds her yet again that ishaani innocently hands her entire salary to baa all the time. Baa says that she isnt doing any favour, as she knows that once baa gets her stature, name, money and fame back, she would shut everyone’s mouths. She is oblivious of the news headlines. The newspaper headlines read that today, the Parekh mansion shall be up for auction. Two unidentified guys, come looking at the mansion, that for one and a half years, the case went but without any descision and finally the court ordered for mansion, and they gave an advertisement for the same in the dailies. they wonder if the parekh family even knows about this auction or not. The screen freezes on one of the guys’ face. Precap: Chirag’s mother tells chirag to put up with this charade for some more time, as if the Parekh family wins the case, they shall get married soon, and if they dont, then she would herself go and call off the relation.